DL&W company photo, Steamtown NPS, Image #X1689. Ray Breyer is back with another detailed look at the freight cars in a period image. This time, Ray has three images to use from the same facility and were taken on the same day. Click on any image here to view a larger size. As an early rail modeler I’m constantly on the lookout for high-quality photos of period railroading, whether it’s my favorite prototype’s infrastructure, rolling stock or engines. I’m also looking for good images in context, showing why things may look the way they do, especially the area surrounding a given image’s viewpoint. Finally, just about any halfway decent period is fair game, since it can highlight rare freight equipment or ‘general atmosphere’ which may prove to be useful when working on my owl layout’s scenery. Sometimes I luck out. Finding a new, single, fuzzy image with identifiable freight cars in it is always helpful in filling my period railroading database, but finding a single, high-quality image with several items of interest is always better. Finding several different photos of the same scene, shot from various perspectives, is a ‘Holy Grail’ for me, and is almost never something I stumble upon. But recently, while digging through the thousands of images in the Delaware, Lackawanna & Western Company Photos, I ran across just that: a holy grail of early railroad images. Specifically, four very good photos highlighting a single freight house, all taken by the same photographer on the same day. The images may not document one of the freight houses I need to model, and they might not be from the exact year I’m modeling, but they’re close enough to both. The images reveal a typical day in the life of a typical large town freight house. The buildings, rolling stock, and grounds clutter are all part of the fabric of railroading on the 1920s, and all of the items in the photos will prove to be useful once I get to where I can model similar freight houses in three areas of my own layout. Before I dig into what cars were sitting at the freight house, I’ll go into a little context of what we’re looking at. In the years around World War One, railroads were pulling themselves out of receivership from various late 1800s recessions. Some railroads were healthy and experiencing boom times. The Delaware, Lackawanna & Western Railroad was one of the railroads that was financially healthy, flush with cash, and ready for expansion. The railroad went on a new construction building spree, with huge infrastructure building programs happening across their Scranton to Hoboken mainline. In the heavily populated New York City metropolitan area, part of that construction effort focused on right of way raising to eliminate as many grade crossings as possible. Lifting the ROW through the NYC suburbs in New Jersey meant more than just building a big berm to plunk tracks onto and a few new bridges, it also meant building all-new railroad stations and general improvements of infrastructure and to make operations more efficient. The freight house in Orange as it looked on an overcast day in December, 1920, and how it looks today thanks to a Google Maps street view. Today the building is used by NJ Transit as a signal maintainer’s supply office, but the area has survived relatively intact for nearly 100 years. Top image Steamtown NPS, image #X1688, bottom photo Google Maps. Construction of the grade-separation project in eastern New Jersey began in 1914, and by 1918 was largely complete. The station and freight house in Orange, now on the National Register of Historic Places, were both built between 1917 and 1919, making these images of brand new railroad facilities. 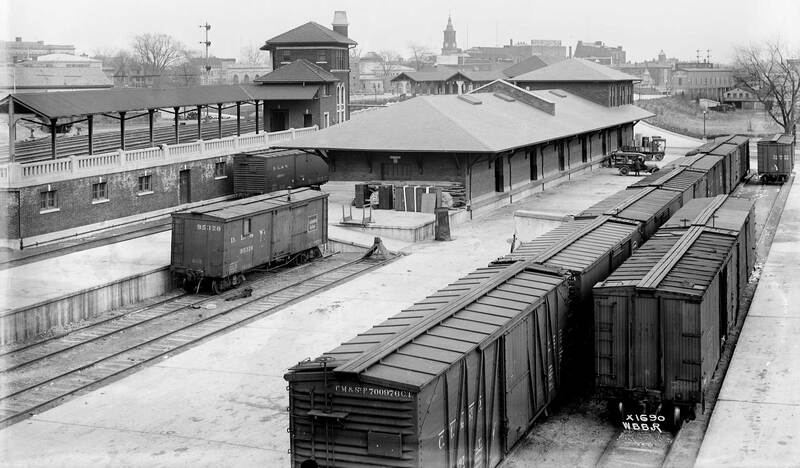 While the station was a fairly typical and small suburban stop for a major metropolitan area, the new freight house area was huge by any standard, with a large, two story building and ten tracks that could accommodate 100 cars. Before and after aerial views of the area show that the DL&W completely changed the operations of the area during the grade separation project. The valuation map shows that the Lackawanna flipped everything to the side of the grade, and simplified the operations of their freight terminal in the city, while significantly increasing capacity. A huge freight terminal built new to accommodate a large number of small shippers with partial freight car loads is a product of its times. Built when cross-country roads were still generally impassable for much of the year and when even city streets became sinkholes of muck during wet seasons, the box car was then the only way to reliably move freight across the country, and sometimes even across town. But things were about to change quickly. Tens of thousands of World War One veterans had just come home, having experienced the first mechanized war. Even as early as 1914, horses and mules were beginning to give way to trucks and tractors during that conflict, and the country was full of vets who had new experience in driving trucks and cars (and in how much easier it was to care for a truck as opposed to a horse!). The ‘Good Roads Movement’ gained additional impetus in the years shortly following the war, and paved roads sprang up across the country. By the mid-1920s roads were better, trucks were more reliable, and automobiles were within the reach of most middle-class American families. People and goods quickly transitioned from rails to roads, and short haul and LCL traffic quickly dried up on railroads. Large general freight terminals like these became obsolete, and with rare exception would never be built again. However, this transition took a couple of decades and through the 1920s and 1930s freight houses were an important destination for goods across the country. DL&W company photo, Steamtown NPS, Image #X1690. Thankfully, this DL&W freight terminal was a busy place when the company photographer decided to make a stop to record the new construction in the area. Given the lack of traffic on the roads and lack of passengers waiting at the platform, these images were likely taken either early in the morning, or on a weekend. 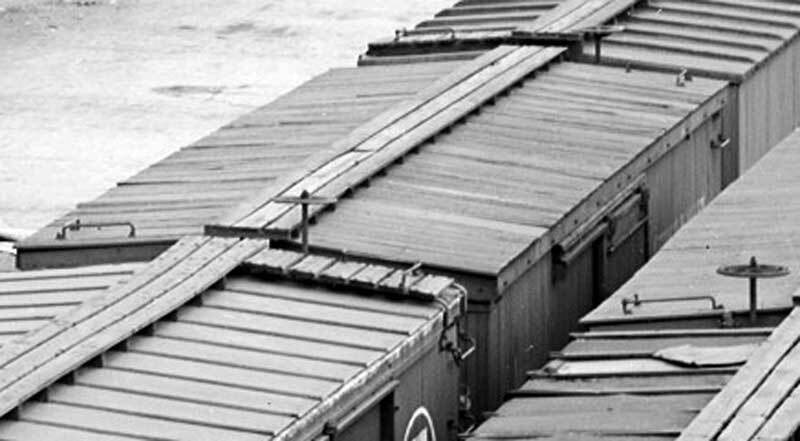 No matter; there are still eighteen boxcars sitting at the terminal, all waiting to be loaded and unloaded. While we can’t know what was in each of those cars, we can at least tell what most of them were, giving us a few clues as to where goods were coming from in the region. 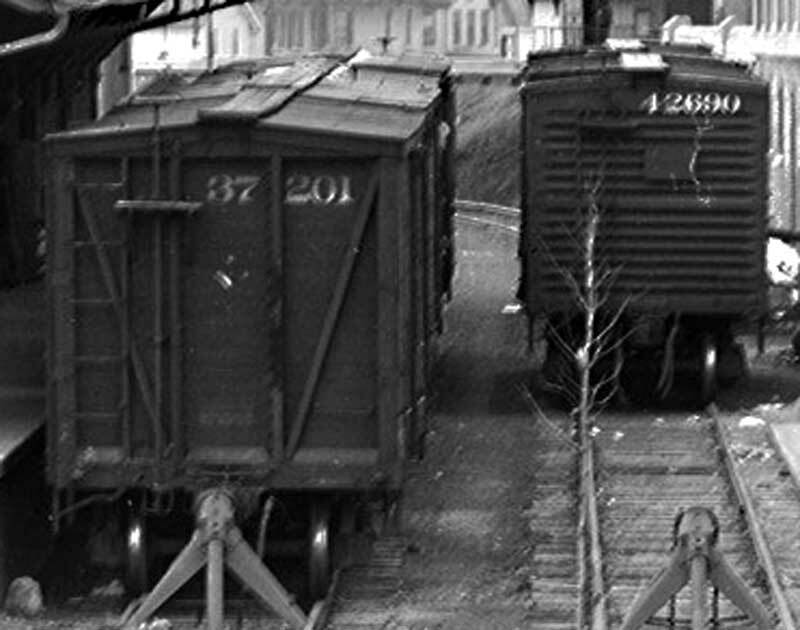 A simple depiction of the eighteen boxcars parked around the Orange freight house. Most were clustered around the freight house building itself for good reason: nobody likes to walk! The eighteenth car might have been full of Limburger cheese…..
We’ll start our examination of the cars at Orange by looking at the six cars to the north of the station, which includes the only cars that are completely unidentifiable. Three cars can be clearly seen though, and they’re all DL&W home cars. DL&W 42690 (car #1) and 42683 (#2) are both from the same group of cars, 42000-42999. These are fairly new cars, having been built by American Car & Foundry (ACF) in late 1915. At five years old their paint has held up well, even in the highly acidic East Coast air of the industrial revolution. 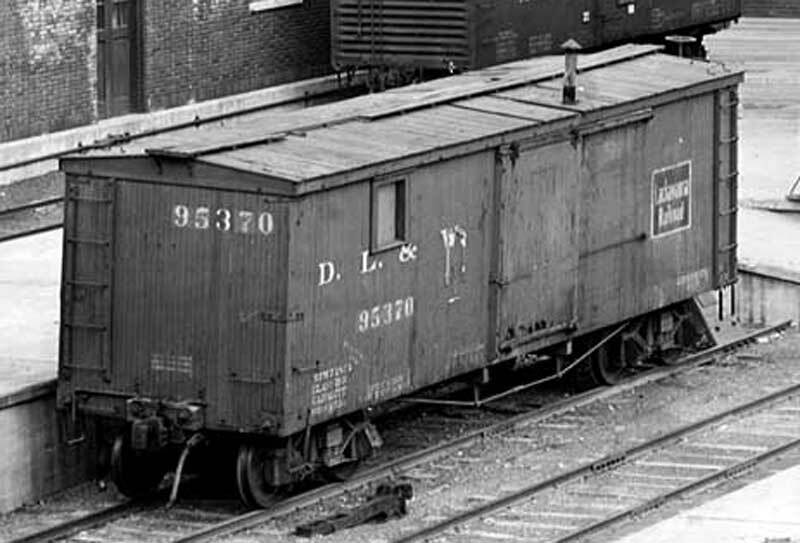 These cars represent the DL&W’s ‘new standard type’ boxcars, and the road would buy 1,000 more in 1922. 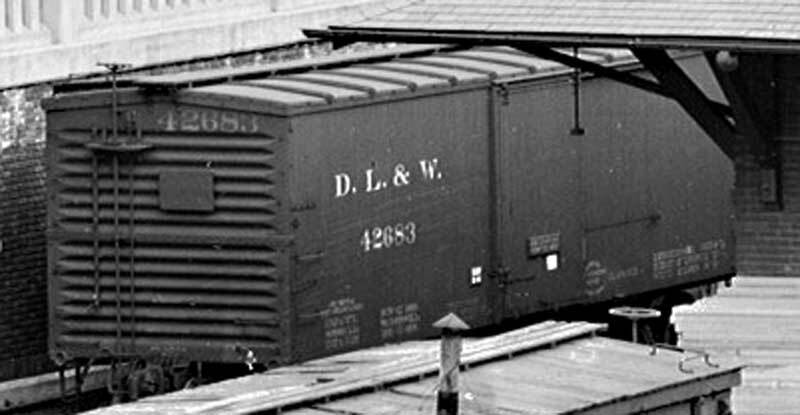 Those cars would mark the road’s last purchase of short freight cars; the DL&W would quickly standardize on a 40-foot inside length box car type similar to USRA double sheathed boxcars. Modeling these DL&W cars will soon become easy to do, with the release of Accurail’s new 1400-series kits. DL&W 37201 (car #3) is a 1909-built car from ACF, and was part of the road’s 36000-37399 series. A standard type of car for the Lackawanna, these and another 1,500 similar cars built in 1910 made up nearly 15% of the road’s total box cars. The ends are completely typical for the time, being ‘composite’ type (sometimes called “Indestructible Ends” in trade advertisements), and are simply conventionally-made early 1900s ends without the exterior sheathing added. 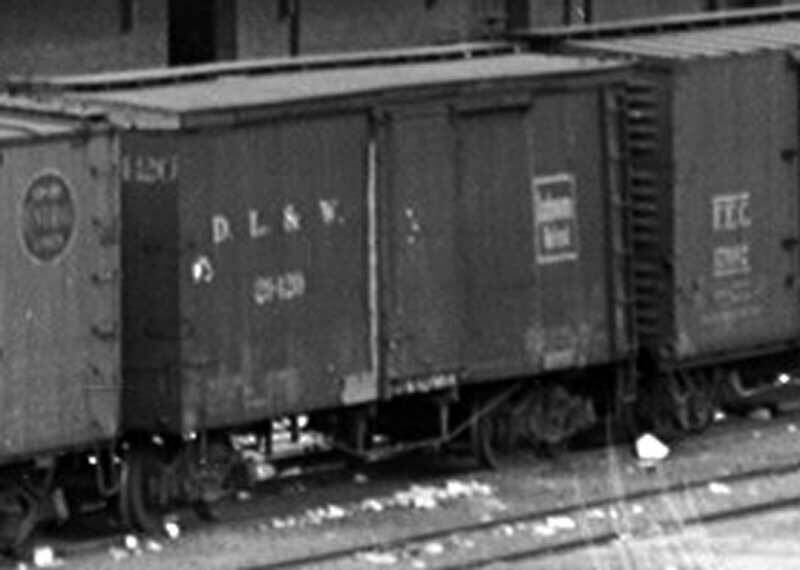 This was done as a weight-saving measure, and are a transitional form between double sheathed boxcars with interior steel support framework, and single sheathed boxcars. 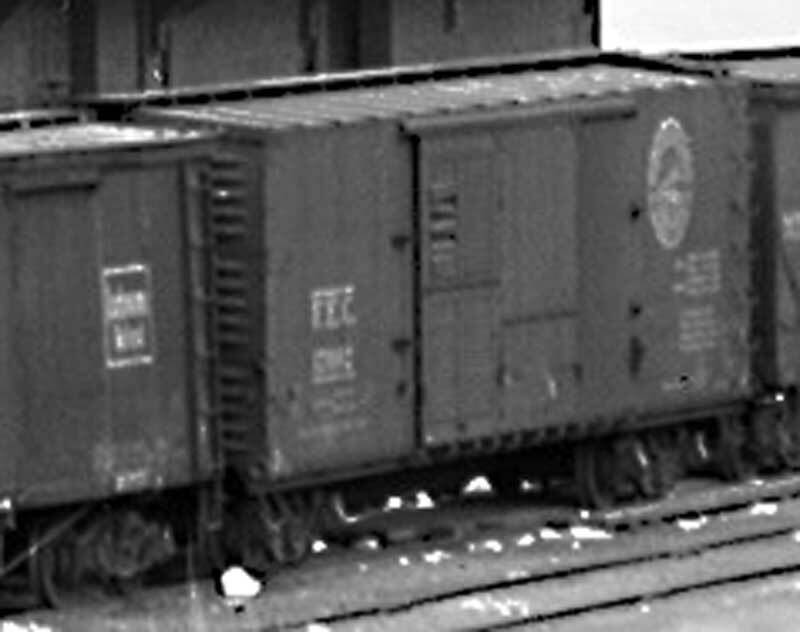 The three other boxcars on this side of the freight house (cars #4, 5 and 6) can’t be seen in any of the four images of this series, but they could well be more DL&W boxcars, given that their roofs are all identical to that on car 37201 and that they’re parked closest to the freight house and passenger station. 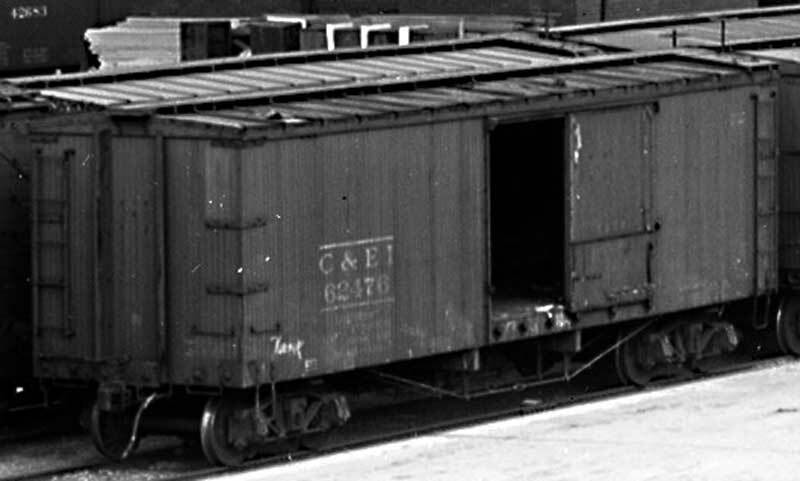 Car #7, sitting next to the end of the freight house and the elevated loading dock ramp is a non-revenue boxcar, DL&W 95370. This car was built by the DL&W shops in Scranton in 1892, and was one of 387 other tool and supply cars rostered by the railroad. Likely, it’s here in use as a material storage car for car repair crews; that’s a broken coupler and drawbar sitting next to its A-end truck. This is an important detail to discover: with a capacity of over 100 cars, and with cars coming from all over the country, there would be a ready need for a full-time car repair crew to be stationed here, even if all they could do was make cars road-worthy enough to drag to a better equipped car repair yard. A material storage car used in this context gives us all a good excuse to model a few older cars in our fleets! Let’s move on to the main group of cars. Of these ten cars, two are foreign road cars, and three others are from ‘near connection’ roads. Four of the others are from the Midwest, most likely originating from within 100 miles of Chicago, and one is from the deep south. It’s a good cross-section of what we should expect to see at a large freight terminal, even if the group is missing Western cars. This car showed up in two of the photos, so this side-by-side image is of the same car from different photo angles. 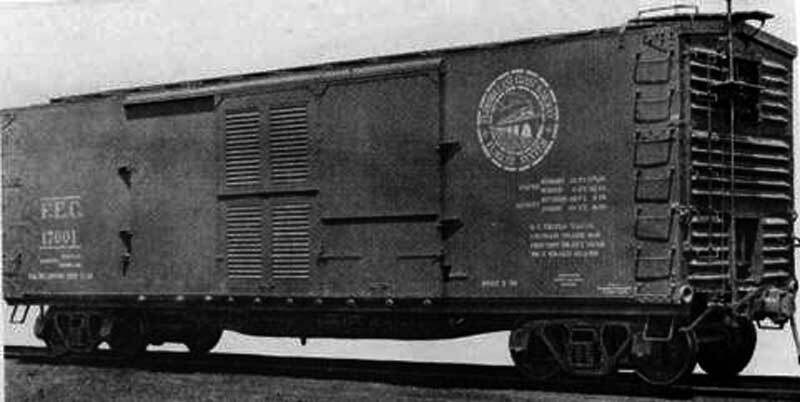 CMO 33320 was part of the Omaha’s largest group of boxcars at the time, 1,500 cars were built by ACF and Haskell & Barker in late 1915. These cars were a ‘tag-along’ order for similar cars for the Chicago & North Western, and represent the North-Western’s early experimentation with single sheathed box car designs. 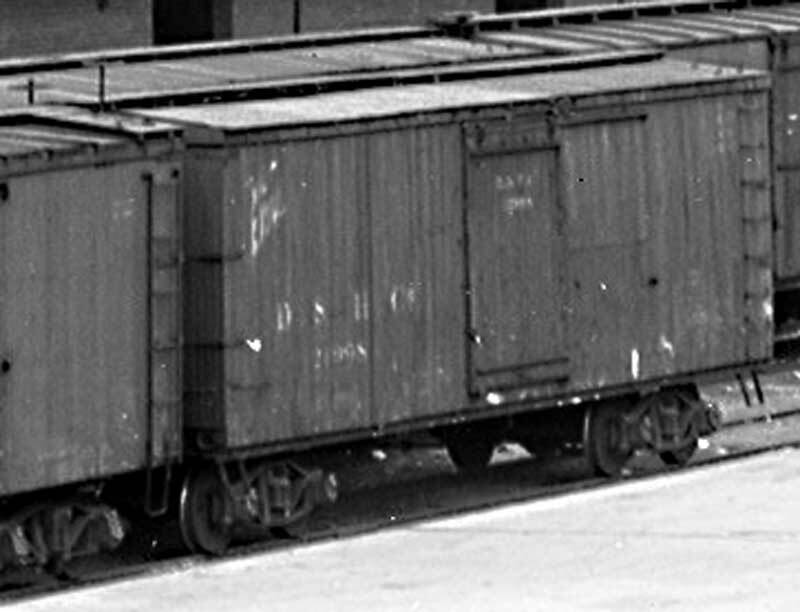 These early 40-foot Fowler-type box cars served on the C&NW for a long time, finally dropping off their roster due to the 1954 K-brake ban. Of all eighteen box cars shown in these photos, this is the only one that we know what the load is: hay. Remember this is 1920, and actual horsepower and the related fuel is still a factor in everyday life. It is a bit ironic that the hay is being loaded onto a motor truck! This is another example of a road’s most common boxcar making an appearance. FEC 17001-17500 were brand new cars in 1920, and this car (which may be number 17092) is less than seven months old. It’s also already showing damage to its ventilated door. Given the type of car and where it’s from, it’s likely the car is carrying oranges, avocados, or other sun belt produce that didn’t need to be iced in December. 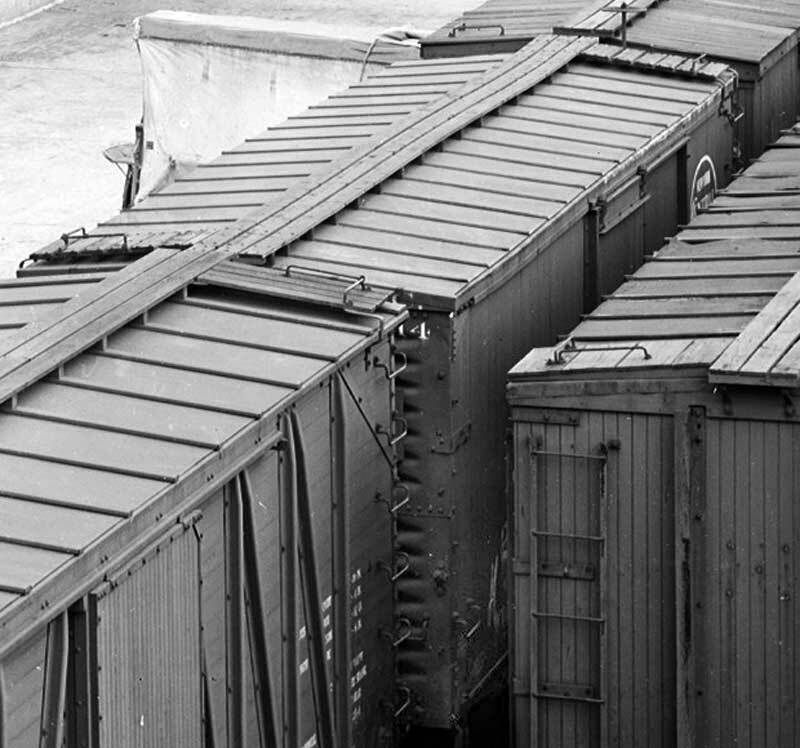 These FEC ventilated box cars are a variation on the USRA double-sheathed box car design. 500 of these non-standard design cars were assigned to the FEC by the USRA. This is probably the oldest in-service car in the group, built by Pullman in 1904. Surprisingly, the antique cars in this series would soon be rebuilt by the DL&W with steel center sills and roofs, and in some cases steel ends, and would serve on into the early Depression years. The next car in the lineup is a semi-unidentifiable NYC Lines 38-footer. Judging by the door, the T-section trucks, and what seem to be steel ends (there’s a vertical seam near the ends), this is probably a 1912-built car that was rebuilt with steel body elements just before WWI. It’s also probably a NYC car, rather than Big Four, Michigan Central or Lake Erie & Western car, since the cars bought for subsidiary Lines roads generally had ladders instead of grabs. This is another car that we’ll all be able to model once Accurail releases their new kits! This car has me puzzled. It’s a ‘wrong way door’ car, but it’s definitely not from the Erie or Lehigh Valley. The road name on the right side of the car isn’t legible. The character count seems to be consistent with the Centralia & Chester, but that railroad disappeared in 1900. About the only somewhat close match for this car that I can find is from the Baltimore & Ohio. Image from the Columbus Railroads website. Above is a B&O M-8-B class car, built by Pullman in mid-1912 and many were rebuilt through the Teens. B&O 99115 seen above was rebuilt by the Ralston Steel Car Company of Columbus, Ohio in 1912. The B&O had thousands of M-8 cars on their roster in a few subclasses. 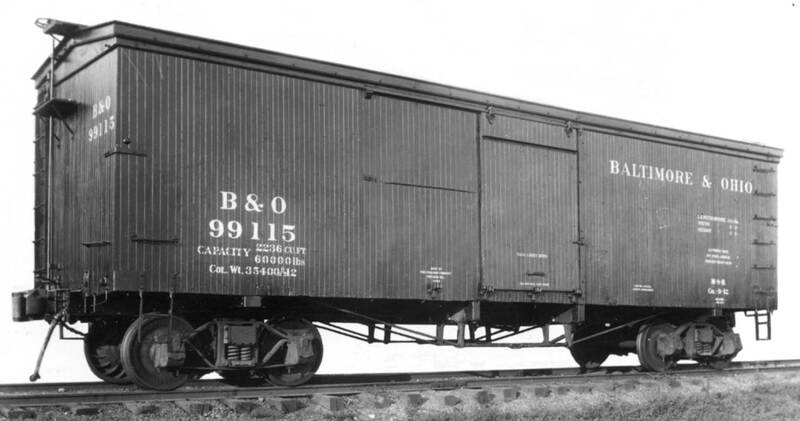 There were 12,067 M-8 and subclass cars tallied in a January 1925 B&O Summary of Equipment, which represented 32% of the B&O’s 1925 box car fleet. Most of the spotting features of the car in this builder’s photo are present in the mystery car, so it’s a pretty safe bet that the car is an M-8-B. The ‘herald’ on the left may well be leftover adverting paper. This is another short NYC boxcar, with a car number of 2xxx14. The two as a first digit means that it’s a rebuild and repaint, most likely of a 1912-built Lake Shore & Michigan Southern box car. And like the previous NYC car, this is another possibility for the Accurail model. The image of this car is a great catch, and is definitely the highlight of the group, since it’s a rare view of a USRA boxcar in service in its as-built paint scheme. And if you’re going to have only two USRA single sheathed boxcars in your fleet, you want two road names: Pennsy (9,760 cars) and the Milwaukee (4,000 cars). These were an important car for the Milwaukee Road. While the line was no stranger to large boxcars these were their first single sheathed cars, and they changed everything. From 1919 until the beginning of their home-built rib-side boxcar program, the Milwaukee Road bought nothing but single sheathed box cars by the thousands. Seeing two American Fowler-type box cars together in a period photo is always fun, and finding a Wabash car is even more exciting (their cars tend to disappear from view after 1910). While most of us don’t associate the Wabash as being a “Fowler Road”, they did roster 3,200 of these cars, making the Wabash were second to the Erie in the number bought (in the United States, of course!). Wabash 76056 is one of their first Fowlers, built by ACF in 1912. Notice that this eight year old car has seen some rough service in its life, since it has two completely different doors! The door without bracing is the original. Sadly, the Wabash retired all of their short Fowlers in the early 1930s, which is probably why there are so few in-service photographs of them. D&H 21998 is a local car, and is one of a large number of similar box cars on the D&H roster that lasted a ludicrously long time in service. 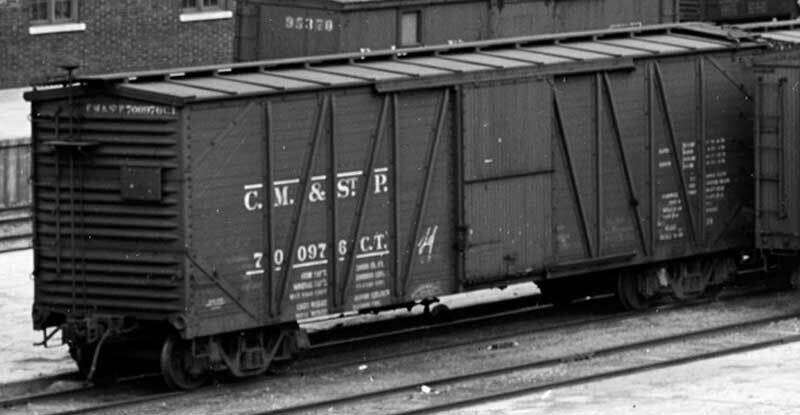 Originally part of a 1,500 car order with ACF in 1906, these early examples of box cars with all-steel underframes would be hauling freight into the late 1950s, and running as MOW cars into the 1970s! There’s a very strong possibility that this dirty, old, beat up car outlived every other freight car in this yard, and possibly even outlived the DL&W. The C&EI is another of those roads that most modelers tend to forget about, so it’s nice to see one of their older box cars so prominently featured in this image series. Car 62476 is definitely an older technology car, but don’t let the truss rods fool you: the car is only four years old, having been built in 1916. It’s also 39 feet long, making it one of the larger box cars in the yard. Notice the REALLY beat up roof: one of the primary complaints of railroad management was the horrible condition that everything was left in by the USRA. 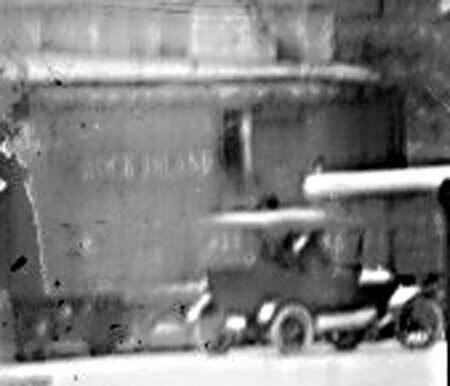 The print is too blurry to make out a road number, but the car is definitely a Rock Island double-sheathed box car with a metal roof. It’s probably also a 40-footer; got to love those generous Midwestern clearances! The Rock is one of those railroads that we all know about, but rarely think about or model. And that’s a shame: any railroad that had popular songs written about it had to be doing something right, and SHOULD be modeled. Moreover, the Rock Island was a powerhouse in the 1920s, being one of the few railroads to do well under Federal control during the war and about to undertake another major expansion of its western lines. With nearly 32,000 boxcars on its roster in 1920 their cars could be seen in every corner of the country. I doubt it’s one of their rebuilds with Van Dorn ends, however. So…overall, a good cross-section of typical boxcars for the region, with no real surprises. I suppose that there could be a truly unusual car or road name hidden in the four unidentifiable cars in the images, but that’s highly unlikely. And that’s OK, since this group of photos illustrates the typical, the mundane, and the boring. Because that’s real life! It also encourages us 1920s modelers to get working on our fleets to add more ‘typical for us’ freight cars to our rosters, and to keep the pressure on manufacturers to provide us with a wider selection of products to choose from. The upcoming Accurail cars are a wonderful start, but we can use more detail parts. Double sheathed boxcars are easy to scratchbuild, so an assortment of good hardware would be most welcome. Camel door hardware would be a good start, as well as any sort of door latching hardware. A wider selection of arch bar trucks would be a bonus. Thanks so very much Ray and Eric! Terrific post. This could be used as a text book example of how to read a photograph as a primary source document. Glad you liked the post Maynard! The lack of horses and a general lack of road apples was interesting to me as well. From what I’m finding through looking through tens of thousands of period photographs is that horses tended to disappear very quickly from urbanized areas East of the Mississippi very quickly: in 1914 they seem to be everywhere, but by 1920 it’s clear that internal combustion now dominates. That’s an important detail to know when you’re working on scenery for an early rail themed layout. Ray, this is a very excellent discussion. Notice how the door ways of cars 16 and 17 align with cars 12 and 13 to allow passage from the freight house dock to these cars. A common practice for this period. Also it appears the freight house doors are spaced for 36-ft box cars. I am not sure what changes were made to the freight house when the standard became 40-ft for box cars. Glad you liked the piece. Stay tuned for more of them! As for the freight house doors, from what I’ve been able to tell the “36 foot spacing” thing is mostly a model railroading old wives’ tale based on nothing in particular. I’ve yet to run across a single old structure that’s had all of its doors shifted over (and if you shift the first door over four feet, you have to shift the second over eight, and the next 12!). 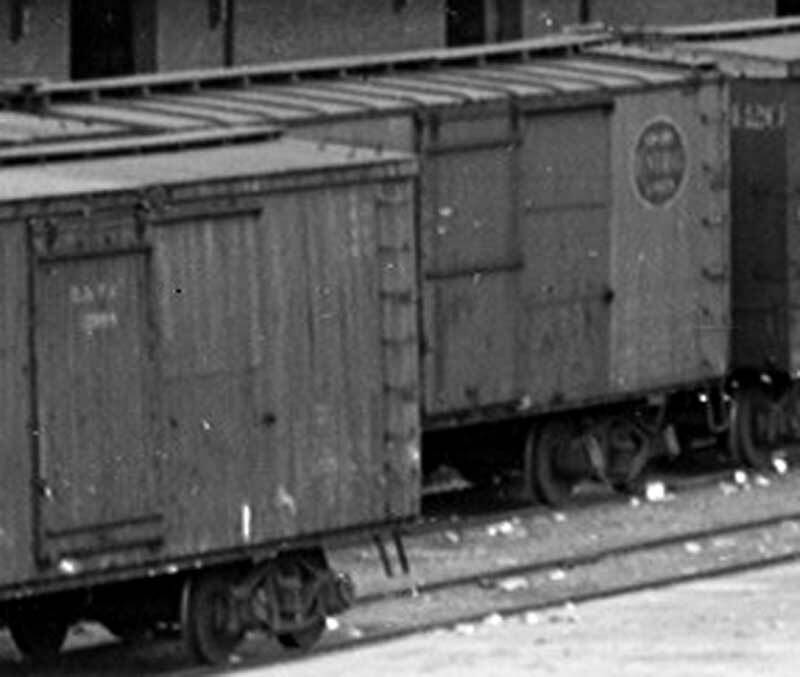 Short boxcars stopped being a majority in the mid-1930s, and by then freight houses were on their way out, meaning that railroads wouldn’t have bothered re-bricking the doors. Besides, muscle power was cheap, and the unloaders all had wheeled dollies anyway, so moving over a little while rolling isn’t a big deal. The alignment of the cars IS interesting, but in this specific context may well just be out of habit and good operating practices. I’d think that the cars in the open part of the yard would each be for an individual consignee, so there’d be no real need to pass between cars. If you’re modeling a very tightly packed freight terminal like the IC’s South Water Street the alignment is far more critical! Congratulations, these are wonderful photos and an insightful, well crafted blog post. I enjoyed reading it and learned several things new to me that make RR history so enjoyable. And I have a question for you. You state: “DL&W 37201 (car #3) is a 1909-built car from ACF, and was part of the road’s 36000-37399 series.” The AC&F order list does not include any orders 1907-1909 that would either provide for a 1909-built 1400 car count or some part of one (at least that I could find). Parenthetically, neither Eric Neubauer’s PSC nor PUL lists provide an alternative origin. Can you share more information about the origin of this series? A little information on DL&W 37201 in return. As depicted in the photo it is a rebuild of its original plain double-sheathed end and upgraded to USSAS, as well, but still retaining its original roof. This upgrade program started in the first half of 1916 and by 6-1916 #37201 is listed in the ORER as having the 35-10′ 1/2″ inside length of the single-sheathed end. Some cars of the series were rebuilt to a 36′-5″ inside length an increase that commonly indicates steel ends. Do you know of any photos of this series with steel ends? Upgrading most of the series to an outside metal roof apparently started in the early 1920’s. The series is gone between 7-1934 and 7-1935. I just checked those photos again: no corrugated steel ends on any of them, but “Indestructible” composite ends do start showing up by 1918. The steel I beams used on these composite ends were probably thinner than the 6×6’s used in the original car construction, which would account for the slight increase in the cubic capacity. Excellent analysis and fine discussion, as we’ve become accustomed to from Eric and Ray. This site continues to provide great inspiration for me; in these particular images, the Autocar delivery truck! I’m building a freight transfer warehouse for the RR Line forum challenge by backdating a modern structure, so all of these great details really help. 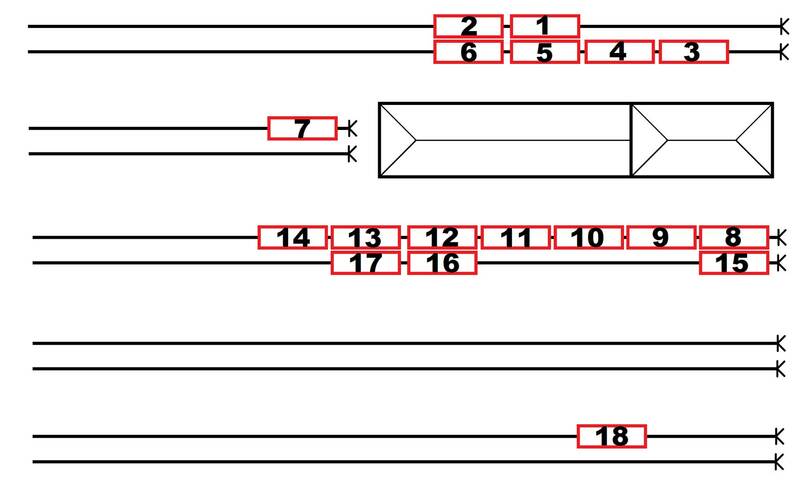 Also interesting is the track spacing – more is devoted to unloading directly from freight cars into trucks/wagons than from box cars into the freight house. My misguided youth was spent believing cars are spotted at either industries or on “team tracks”, which I suppose these paved areas along the tracks could be called, but really they’re part of the freight station complex. My vote for detail parts needed – a set of USRA double-sheathed car details, but especially the door guides. Thanks for identifying the truck Galen! I did want to get into a discussion on some of the vehicles and other superdetailing items, but honestly, I don’t know enough about early motor vehicles! Comparatively, digging into old rolling stock is far easier, since they come in fewer varieties. Great set of photos, you do know how to root around the Steamtown collection! Im guessing the upcoming Accurail 36 foot box cars will be very popular. Thanks for the info. I’ve been looking for info on the Orange yard, and this is terrific. As part of my misspent youth, I would hang out here on occasion and watch the milk car for the Borden plant get picked up in the afternoon. At that time, I remember that the area occupied by car #18 was frequently occupied by empty but trash-filled box cars, probably for cleanout. Interestingly enough, my grandfather may have spotted those cars. He engineered the “Orange Drill”, and worked for the DL&W for 54 years.